This article explains the working of different diode clipper circuits like Positive and Negative Diode Clippers, Biased Clipper circuit, and Combinational Clipper Circuit with the help of circuit diagrams and waveforms. What is a clipping circuit? A clipping circuit or a clipper is a device used to ‘clip’ the input voltage to prevent it from attaining a value larger than a predefined one. As you can see in the picture below this device cuts off the positive or negative peak value of a cycle. The basic components required for a clipping circuit are – an ideal diode and a resistor. In order to fix the clipping level to the desired amount, a dc battery must also be included.Â When the diode is forward biased, it acts as a closed switch, and when it is reverse biased, it acts as an open switch. Different levels of clipping can be obtained by varying the amount of voltage of the battery and also interchanging the positions of the diode and resistor. Depending on the features of the diode, the positive or negative region of the input signal is “clipped” off and accordingly the diode clippers may be positive or negative clippers. There are two general categories of clippers: series and parallel (or shunt). The series configuration is defined as one where a diode is in series with the load, while the shunt clipper has the diode in a branch parallel to the load. In a positive clipper, the positive half cycles of the input voltage will be removed. 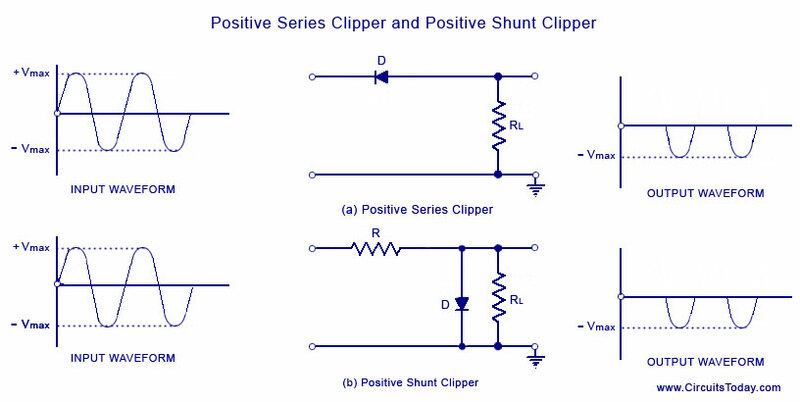 The circuit arrangements for a positive clipper are illustrated in the figure given below. As shown in the figure, the diode is kept in series with the load. During the positive half cycle of the input waveform, the diode ‘D’ is reverse biased, which maintains the output voltage at 0 Volts. This causes the positive half cycle to be clipped off. DurÂ­ing the negative half cycle of the input, the diode is forward biased and so the negaÂ­tive half cycle appears across the output. The negative clipping circuit is almost the same as the positive clipping circuit, with only one difference. If the diode in figures (a) and (b) is reconnected with reversed polarity, the cirÂ­cuits will become for a negative series clipper and negative shunt clipper respecÂ­tively. 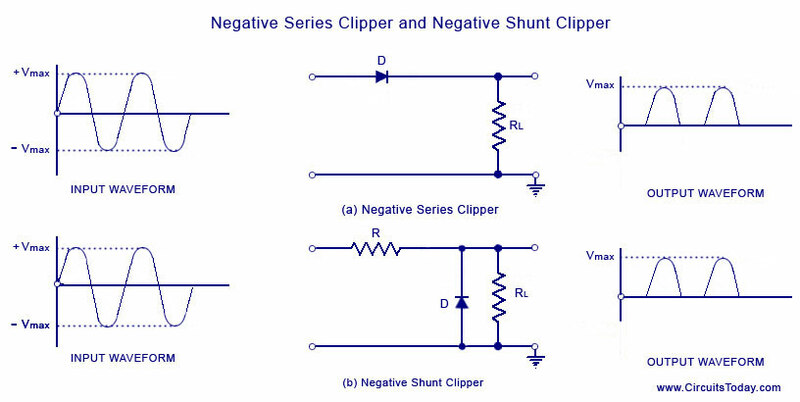 The negative series and negaÂ­tive shunt clipÂ­pers are shown in figures (a) and (b) as given below. In all the above discussions, the diode is considered to be the ideal one. In a practical diode, the breakdown voltage will exist (0.7 V for silicon and 0.3 V for Germanium). 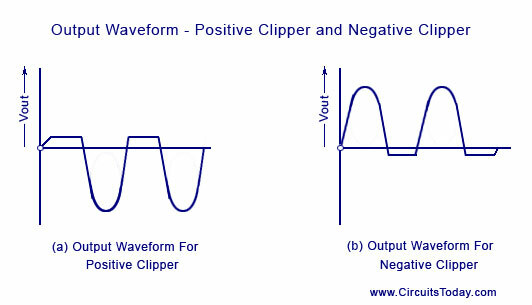 When this is taken into account, the output waveÂ­forms for positive and negative clippers will be of the shape shown in the figure below. A biased clipper comes in handy when a small portion of positive or negative half cycles of the signal voltage is to be removed. When a small portion of the negative half cycle is to be removed, it is called a biased negative clipper. The circuit diagram and waveform is shown in the figure below. TIn a biased clipper, when the input signal voltage is positive, the diode ‘D’ is reverse-biased. This causes it to act as an open-switch. Thus the entire positive half cycle appears across the load, as illustrated by output waveÂ­form [figure (a)]. When the input signal voltÂ­age is negative but does not exceed battery the voltage ‘V’, the diÂ­ode ‘D’ remains reverse-biased and most of the input voltage apÂ­pears across the output. When during the negaÂ­tive half cycle of input signal, the signal voltage becomes more than the battery voltage V, the diode D is forward biased and so conducts heavily. The output voltage is equal to ‘- V’ and stays at ‘- V’ as long as the magnitude of the input signal voltage is greater than the magnitude of the battery voltage, ‘V’. Thus a biased negative clipper removes input voltage when the input signal voltage becomes greater than the battery voltage. Clipping can be changed by reversing the battery and diode connections, as illustrated in figure (b). 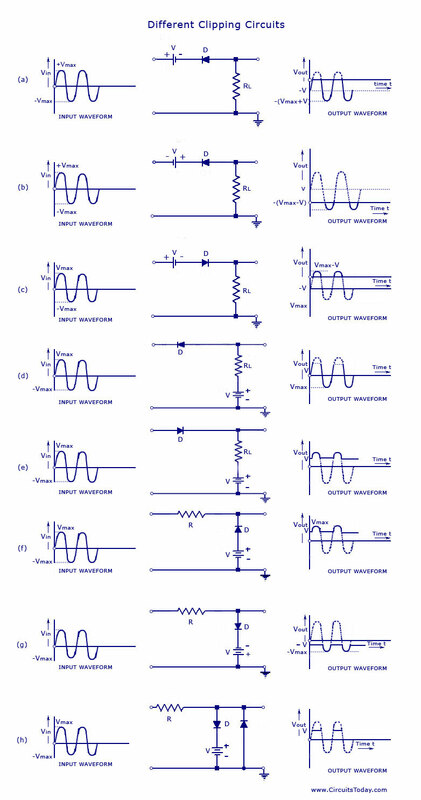 Some of the other biased clipper circuits are given below in the figure. While drawing the wave-shape of the output basic principle discussed above are followed. The diode has been considered as an ideal one. When a portion of both positive and negative of each half cycle of the input voltage is to be clipped (or removed), combination clipper is employed. The circuit for such a clipper is given in the figure below. The action of the circuit is summarized below. For positive input voltage signal when input voltage exceeds battery voltage ‘+ V1‘ diode D1 conducts heavily while diode ‘D2‘ is reversed biased and so voltage ‘+ V1‘ appears across the output. This output voltage ‘+ V1‘ stays as long as. the input signal voltage exceeds ‘+ V1‘. On the other hand for the negative input voltage signal, the diode ‘D1‘ remains reverse biased and diode ‘D2‘ conducts heavily only when input voltage exceeds battery voltage ‘V2‘ in magnitude. Thus during the negative half cycle the output stays at ‘- V2‘ so long as the input signal voltage is greater than ‘-V2‘. In series clippers, when the diode is in ‘OFF’ position, there will be no transmission of the input signal to output. But in the case of high-frequency signals transmission occurs through diode capacitance which is undesirable. This is the drawback of using the diode as a series element in such clippers. In shunt clippers, when the diode is in the ‘off condition, transmission of input signal should take place to output. But in the case of high-frequency input signals, diode capacitance affects the circuit operation adversely and the signal gets attenuated (that is, it passes through diode capacitance to ground). To gain more knowledge about various other Clipping circuits – say Clipping circuits using Transistors, Applications of Diode clippers etc. Follow the links below. I have a doubt.In the first 3 example input signel is directly given to a cell. Can apply a input signel directly into a cell.please any one provide the answer. can someone plz tell me how will practicall biased clipper work (where we have a dc source plus 0.7V of silicon diode itself also)? My doubts r not cleared yet…. thanks for give information. thank u once again. There are three more names of Clipper,one of them is known as “slicer”… !!! Please tell that other two names of Clipper circuit! i don’t think so… there is no explanation of any circuits..
thanks a lot because it was necessary for me . nice wording and good explanation?but pics are too little>?? This is one of the best ways that solve the students problems …Thank You ..
thankyou very much.i never understood how the biased ones.thanks to you ,now i do.i am very grateful. where are the formulas ? information about other cliper circuits not given so i wasnt able t understand it well…plzzz can you provide me sufficent info 4 this..?? REALLY I APPRICIATE IT AFTER DEEPLY STUDY……….I HAD PROBLEM FOR ANALYSIS OF CLIPER CIRCUIT ,,,,,,BUT I HAVE NO PROBLRM NOW………………THANKS ALOT…..
the whole explanation is very nice…………..
i have understood this very well now…..
simple and to the point explanation. wish my lecturer could read this prior to class. i understd this very well…..
You are right, the biased negative clipper output wave form doesnt clipped off. please explain combine diode circuit with Rquation solver by 3 steps which are given in Boylested Book…. after read this article i get more confused…….? any body can help me..? I feel gud to read all this. this is good way to solve all the student problems. Good one!!!!!!!! .Helped me clear my doubt. I was so confused between series and shunt clippers,but now i think every thing is OK; thank u so much. plz correct the biased -ve clipper o\p waveform…..
thank u for this,but iam still not solved it properly. pls explain more abt clippers. explain shunt & series clippers in 2 versions. thats all THANK U 4 ur help. i wanna design clipper n pspice plz give values of components… thanx alot…….. Images are redrawn. Now they are clear and perfect. Thanks a lot to every one who commented. if diode is not ideal no diagrams are mentioned….. Thanks a lot!!! Easy to understand. really nice description… but images r too small..
thanks….got all that i wanted….wish the ckt diagrams were a little bigger….its not clear…. Hi you have to sufficiently amplify the signal before feeding to this clipping circuit if input is less than 600mV nothing will happen to the waveform as the diode cannot conduct. the output cannot be greater than 600mv (1200mV pk – pk) so you have to amplify further to increase the waveform level. what about the drop across R when shut clipper is considered. When will you tell the diode is forward biased if the drop across R is not known?